Playstation 3 – Which one should I buy? I am ready to bite the bullet and buy a Playstation 3. Looking out at Amazon.com, there are basically 3 options for new systems. So, for those of you that have PS3’s, how much of the hard drive do you use? Is it worth it to get the larger one? I am also confused why would anyone buy the original one, with the 80GB hard drive, when you can get the slim with more room for the same price. I looked at the stats on these and look exactly the same except for the size of the console it self. Any recommendations on which system to buy or your experiences would be a huge help! Can’t wait to play with everyone! The only main difference between the three options mentioned is the hard drive size. The slim no longer supports putting an alternative OS on it, but for most people, that doesn’t matter. The slim is currently the only model being produced, and all other models are pretty much sony trying to get rid of back stock. The 160gb, unless being sold for 350, isn’t exactly worth it. You can buy a 320gb Hard drive from western digital for 99.99, and then get that game for 15 dollars at game stop, or some such area. So, for an extra fifteen dollars over what you would pay for this bundle, you can get twice the storage. So, yeah. Thanks Ryan! You are awesome and that is some great information! Actually, benchmark tests show that the original is *slightly* faster. They also show that the slim uses less energy and is quieter. Honestly my original is absolutely silent (esp when compared to my 360). Either way, enjoy! Feel free to add me as a friend on PSN. I’m “forensic6”. Thanks for that info. I saw that the original was actually $25 less than the slim. 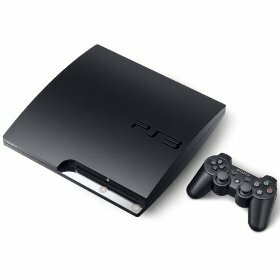 Sony’s website http://www.sonystyle.com has the 80GB model for $249.99 plus a free wireless controller AND free shipping! That is so awesome! Gotta talk to hubby!